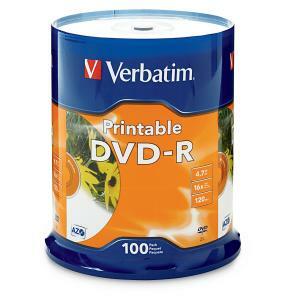 The Verbatim Printable DVD-R 4.7 GB / 16x / 120 Min - 100-Pack Spindle combines an exceptional inkjet printable surface with professional grade, Advanced Azo, recording performance and reliability, making them the ultimate choice for developing, customising and distributing DVD content. Certified for 1X-16X DVD recording and preferred by DVD+R drive manufacturers, Verbatim DataLifePlus DVD-R media uses an advanced Advanced Azo recording dye to provide the highest level of performance, compatibility, and archival life. These discs have been extensively tested and qualified for use with DVD/CD Inkjet printers and duplicators offered by such leading industry manufacturers as Primera, Microboards & Epson.